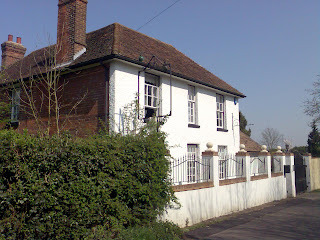 Taking a stroll in the blistering sun last Sunday down Sweets Lane (15th April) I came across a building that used to be The Woodman Pub in East Malling (if it had still been a pub I would have been in there like a shot to ease my sun-drenched thirst). I had previously seen the old picture below and was therefore confident I would recognise the the building in its current form. What sealed it, however, was the empty sign frame, which appears to be the original. What is a shame is that I took my photo from a different angle! When I am next on Sweets Lane I will take a shot from the right perspective and replace the one below. I have carried out a quick search on the Internet, which reveals that the building is now a nursery school. Also, on comparison of the photos there are a few changes to the building to note. Firstly, that it now has three windows at the top and a one bottom centre where the door to the pub used to be. The entrance to the house now appears to be on the right of the building, hence the gate. Unfortunately, the old photo of the Woodman did not come with a date. If anyone knows (even approximately) when this was taken please let me know. Many thanks to Kent County Council for permission to use the The Woodman photo. I would guess that the photo was taken between 1938 and 1952. The Woodman was a Whitbread pub and your photo is sourced from the brewery's official b/w photo. The inn sign we can see is the one originally designed for Whitbread's Wateringbury Brewery manager, John Marchant, by S. Kirkup, and it was used at another pub in Kent (The Forester's Arms, at Sittingbourne) and one in London, possibly as early as 1938. 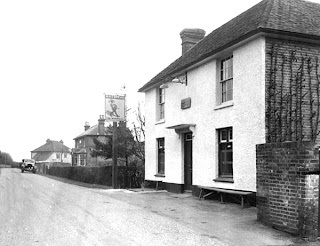 But, according to Whitbread's inn sign miniature card for The Woodman at East Malling, the sign was built at the Wateringbury Brewery in 1952. This is rather strange, however, because the same design for the East Malling pub was shown on Whitbread's West Kent map of their pubs in 1947. Within a few years (around 1956, I think) the sign was replaced with a different design which Marchant had commissioned from Tony Gosby. This design, and the former one, may be seen on another East Malling website - http://www.eastmallingmemories.co.uk/16253.html - to which I contributed a few scans of local inn sign miniatures. May I suggest also that you obtain a copy of David Harper's excellent 2005 book, 'Whitbread- The Inn behind the Signs'. In this you will find photos and histories of many Whitbread inns in Kent, including the other ones in East Malling: The Red Rover and The Rising Sun. Just to correct DJM's comment from April 2007. The Woodman is in fact a private home and not a childrens nursery. The owner of The Woodman own's a number of childrens nurseries across kent. The internet can be so inaccurate if you believe the first thing that comes up on a search! How interesting I am the owner of The Woodman, Sweets Lane and in fact it is my intension to replicate the empty sign with slight adjustments. I have the entire history of the property. I am pleased it is still of interest locally. Be warned the site is a large one, and this is just a hobby of mine. I drove past this place last Thursday and thought "Bet that was a pub!" and sure enough it was. Pity it isn't any longer! Great old photo. My father Martin Edward Collins (Mart to his friends) was landlord of the Woodman from before I was born on 6th of June 1946. The family left the Woodman sometime after 1953 as I remember watching the coronation on A very small t.v. in the saloon bar with a lot of the regulars. from my first memory the pub sign was as shown on the photo. I have several Photo's of the family sitting on the benches which used to be outside the then front door. It was a lovey pub and a great place for a childhood many great days spent in the woods opposite. Interesting to see that the binding was designed by Tony Gosby. He was an architect who bought Phoenix pub a couple of miles away in Red Hill, Wateringbury. I knew both him and John (Jan) Merchant who lived next door to us enemy father was vicar of wateringbury in the 1950s.